Los Animales - 2nd Inning: With 1 out, Devin Shehab singles. Michael Lopez follows with a single. Alex Flores is hit by a pitch. Geno Sammaron reaches base due to a fielding error; with 2 runs scoring on the play. Quinn Lopez draws a walk. Don McGinnis singles; scoring a pair. Los Animales get 4 runs on 3 hits; with 1 Blitzkrieg error and they leave 2. 4-0 Los Animales. Blitzkrieg - 2nd Inning: With 2 out, Jordan Silverman singles to left. Issa Khoury follows with a walk. George Williams is hit by a pitch. Leadoff hitter John Lopez hits a 3-run triple to right. Blitzkrieg get 3 runs on 2 hits and they leave 1 man on base. 4-3 Los Animales. Los Animales - 3rd Inning: Devin Shehab draws a 1-out walk. Michael Lopez hits an RBI double to right. Los Animales get 1 run on 1 hit and they leave 2. 5-3 Los Animales. Los Animales - 4th Inning: Leadoff hitter Geno Samarron hits a leadoff single to right. Quinn Lopez draws a walk. With 2 out, Michael Chukerman reaches base due to a fielding error; with 2 runs scoring on the play. Los Animales get 2 runs on1 hit; with 1 Blitzkrieg error and they leave 2 men on base. 7-3 Los Animales. Blitzkrieg - 5th Inning: With 2 out, Marco Rodriguez reaches base due to a fielding error. John Smith doubles to left. Anthony Saldana hits an RBI single to left. Blitzkrieg get 1 run on 2 hits; with 1 Los Animales error and they leave 2 men on base. 7-4 Los Animales. Los Animales - 8th Inning: Jeb Huling draws a walk; then steals 2nd soon after. Geno Sammaron reaches base on a fielding error; with a run scoring on the play. Don McGinnis reaches base on an error; with a run scoring on the play. Mcginnis steals 3rd and then scores following an error on the catcher. With 2 out, Michael Chukerman draws a walk. Devin Shehab follows with a walk. Michael Lopez hits an RBI double to center. Los Animales get 4 runs on 1 hit; with 3 Blitzkrieg errors and they leave 2 on base. 11-4 Los Animales CHAMPIONSHIP FINAL. Congratulations to the 2014 A-Division Champion LOS ANIMALES ! A special congratulations has to go out to Los Animales manager Ric Pozo. He claims his 3rd PCBL title with Los Animales; while also earning his 3rd Championship MVP honor along the way. And if that isn’t enough, he is soon to become the latest inductee into the PCBL’s coveted Hall of Fame. Deservedly so; given his long and distinguished history with the Pacific Coast Baseball League, Pozo has played a total of 44 seasons with 11 different teams; 17 years as a player and 12 years as a manager. He started with the Rangers back in ’97; then spent a season with the Phillies before joining the Yankees in ’99. In 2004, he left the Yankees to kick-start his own team, The Rebels. 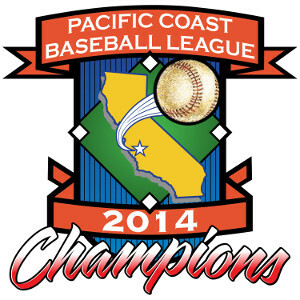 For the next 6 years, the Rebels had yet to claim a PCBL Title. Changes needed to be made; and among those changes would be the team name. So in 2010, Ric re-named his team LOS ANIMALES (which, to the Spanish-impared, means “The Animals”.) The newly-named Los Animales squad would go on to claim 3 PCBL titles over the next 5 years; due primarily to the hard work and commitment of the team’s Hall of Fame manager. As a player, and more specifically a flame-throwing pitcher, Ric Pozo is the active PCBL strikeout leader. He also holds the record for innings pitched, taking the mound more or less every day over the past 17 years for the Indians, Rebels and Los Animales. Aside from winning 20 consecutive opening day games (most of these stats were lost in the great fire of '02 - that's why only Ric can verify this claim), he has tallied over 680 strikeouts, 448 games played, pitched 46 complete games and has won 18 Cy Young Awards. And he's second to only Bobby Cox in managerial ejections. The numbers say it all ... "Welcome to the Hall Mr. Pozo!"